Based on this recording, I believe RCI used the same version of O Canada until their very last days as a shortwave broadcaster. Click here to listen to the clip on the CBC Digital Archives site. This entry was posted in Broadcasters, Nostalgia, Radio History, Recordings, Shortwave Radio and tagged Au Canada, Radio Canada International, Radio Canada International First Broadcast, RCI, rci sackville, WWII, WWII Archives on March 26, 2014 by Thomas. During the Second World War, Switzerland’s fledgling short wave radio service was essential to its attempts to communicate its policies and actions to an external audience made up of both foreign governments and the Swiss abroad. The archives of the Short Wave Service (SWS), founded in 1935, have been digitalised and are now available online (See link). SWS was the forerunner to Swiss Radio International (SRI) which later became swissinfo.ch. The manuscripts of news bulletins from this dark time in Europe reveal Swiss thinking on events both out of its control and right on its doorstep as the country desperately held on to its beloved neutrality. In Switzerland’s national languages (German, French, Italian) as well as English, Spanish and Portuguese, SWS broadcast news and analysis of military events on both sides. It also reported on living conditions of Australian, New Zealand, South African and American POWs interned in mountain retreats, and issued sharp rebukes of external criticism of Swiss government policy. “Switzerland finds herself today in one of the most peculiar situations of her long history. From a certain viewpoint, she is surrounded by one power only. From another viewpoint, she is surrounded, among others, by three defeated powers: Austria, France and Italy. Under these circumstances Switzerland has remained true to her traditional role of guardian of the Alpine passes,” began an English broadcast from Hermann Böschenstein in the wake of the fall of Mussolini in 1943. The same broadcast went on to discuss dashed hopes that Italy’s fall would see a reopening of transport routes to the sea, praised the Swiss influence of the International Red Cross as “incontestable”, and noted that “all-out” training of Swiss army troops had resulted in “quite a few casualties lately” with the use of flame-throwers being responsible in some cases. Lausanne University’s François Vallotton, a specialist in contemporary audio-visual and media history in Switzerland, was unable to resist the lure of such a treasure trove of documents. Vallotton, whose work focuses in particular on the Swiss Broadcasting Corporation (SBC) – the parent company of swissinfo.ch – convened a seminar to undertake initial research on the SWS archive documents. 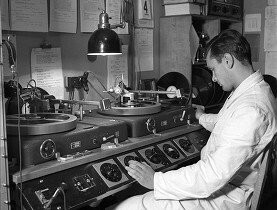 The archives, which have been formatted into a database searchable by keyword, are particularly interesting for historians because the historiography of international radio services has not yet been developed, particularly in Switzerland. 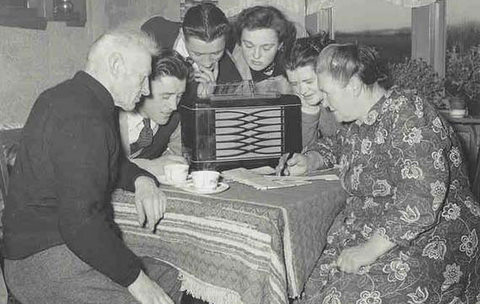 Broadcasts by SWS at that time were also notable for the fact that they were the first news bulletins produced by a dedicated radio editorial team; previously news bulletins had been written and read by journalists from the Swiss News Agency, a press organisation. I have really enjoyed looking through the archives. Of particular interest are the corrections that were made before reading the news. They’re all there. The actual archive database can be found here. Read the full article at swissinfo.ch. This entry was posted in Articles, Broadcasters, Nostalgia, Radio History and tagged Shortwave Radio History, Swiss Short Wave Service, Swiss Short Wave Service Archives, Switzerland, WWII, WWII Archives on September 7, 2012 by Thomas.